The Airshield Pro is a fully protected air circulating face shield that provides excellent face and head protection and provides a constant stream of filtered air. The maximum airflow is 7.6cfm with a faceshield impact protection that meets ANSI Z87.1 standards. The unit is powered by a NIMH 8 hour battery and features an audible low battery warning sound. The battery is easily replaceable and takes 14 hours to charge with the included charger. An airflow indicator is included for checking the airflow before use. The dual filters are 98% efficient and will remove particles down to 0.6 microns. The filters easily replaced when needed. The motor is located away from the forehead area for comfort and to reduce noise. The Airshield Pro weighs just 2.21 lbs. Available as an option are the Ear Defenders to protect against high noise levels. 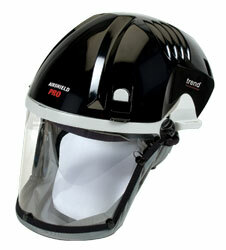 The Airshield Pro comes with 8 hour battery, charger, one visor overlay, filters, airflow indicator and carrying bag. The Airshield Pro Package Deal includes the Trend Airshield Pro, Battery Cradle and one extra Battery. The extra battery can charge in the Battery Cradle while the Airshield Pro is in use.